When Niagara based Red Stone Winery wanted to find the perfect flooring finish for their new hospitality centre and restaurant they looked to pair polish concrete with their exquisite design. Working with DeAngelis Construction,Team Protec helped to capture the vision Red Stone was looking for right, down to the floor finish. Like a Red Stone wine, polish concrete can help create the right mood for your next renovation or project. However with so many strain, aggregate. and sheen options choosing polish is just the first sip. Protec Solutions is happy to take you through what polish concrete can do for your design palate. How "Polished" is your concrete? As the popularity of polished concrete continues to rise; due to it's long term durability, cost savings and over all stylish looks; it seems so does the curiosity around it. While many contractors and architects know what polished concrete is, the language and expectations surrounding the amount of shine or finished looked is as wide ranging as those very experts. The first step toward your polish concrete finish is asking, What kind of finish is desired or works with the project? Dull and matte? Low sheen? shiny look that is slightly cloudy? High sheen with high clarity? Depending on the finish you want your certified installer will use different levels of diamond tooling to achieve your finish. Next, talk at length with your installer about expectations surrounding aggregate exposure and level of shine. Each floor will have it's unique finish, part of the beauty of polish, however your installer should be able to explain what steps he will take to achieve your discussed expectations. The installer should be able to tell you what grit diamond he will use to achieve your look. For example, if you want a low sheen that from a distance, the floor will start to reflect images from the side your installer might refer to this as a level 2 shine, using up to a 400 grit diamond. Call Protec Solutions today for more information on different levels of polished concrete finishes, stains or the finishing process. We are happy to provide a complimentary quote or to simply discuss the possibilities of how Protec can bring you solutions. "Great use of colour." or "Such brazen lines." "Wow, that must have been the perfect canvas." Although the canvas doesn't call the attention the final project does, it is indisputable that a final product owes much of it's beauty to foundation. Construction renovations often call for a previously finished floor to be stripped bare and made to look new again. If you've ever taken chisel and hammer to vinyl tile you know this task is much more complicated than simply peeling a floor. Protec Solutions offer PRO scraping services. 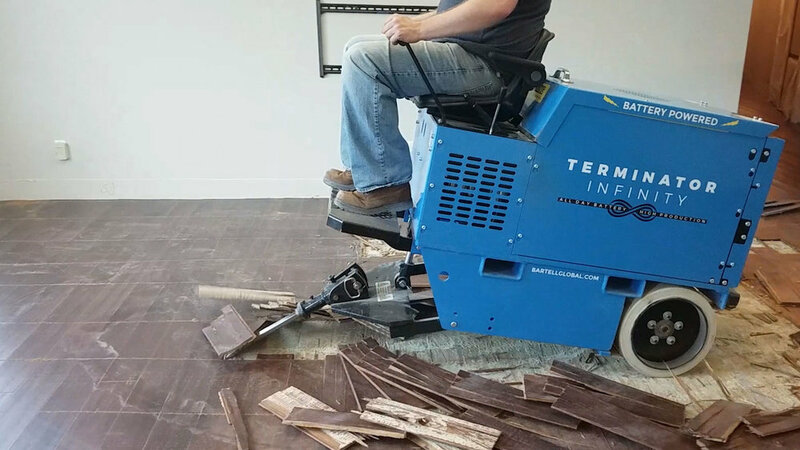 Using an army of specialized equipment as well as staff highly trained in demolition, Protec can quickly remove old ceramic, carpet, vinyl and VCT tile. The PRO advantage of using Protec for flooring removal is the combination of our PRO grinding services with PRO scraping. One call to have flooring and mastic removed by one team at one price. This means less downtime on your renovation leading to a quick, smooth project wrap and more productivity for your company. Using PRO scraping means the most perfect canvas ensuring attention goes where it should to your finished project. 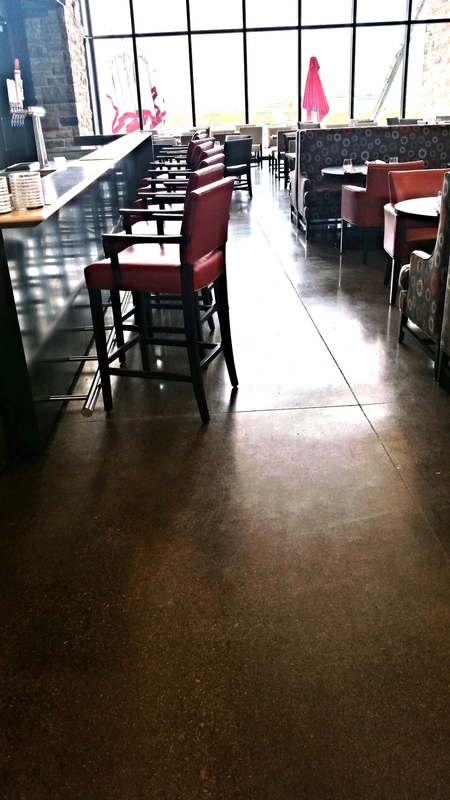 Thinking about specifying polished concrete on your next project? Or maybe you've already specified Terrazzo or...dare I say...carpet, it may be time to take a second look at that spec. Cleanliness issues aside ( read about how friendly polish is to the janitor and your sines here) polish concrete can also save big dollars on your project. A quality polish concrete system such as Retroplate has the lowest life cycle per square foot cost of any floor covering or coating. While carpet comes at a cost of $17.20-$20.00 per square foot for the lifecycle, Retroplate will cost $4.00 to $6.00 per square foot over it's lifecycle which will be much longer than any carpet. Thinking terrazzo? That will cost your client in the neighbourhood of $19.00 a square foot over it's lifecycle. Betting linoleum, porcelain tile, VCT, and acrylic; floors polished with the Retroplate system will bring cost effective life long beauty...something that will keep any client happy and coming back to you for their next build. Of course some situations will call for a coating or other solution. Protec Solutions is available now to guide you and your client to find the perfect solution for your project. Dust Allergies: Nothing to Sneeze at! Any office, warehouse or facility manager will agree, it is hard to find good employees. When those valuable employees are found, trained and being productive the last thing that a manager would want is that employee leaving because of allergen issues in the work environment. Whether it’s in the medical field, industrial sector or even an everyday office allergies and dust should be protected against to protect the bottom line. Southwestern Ontario ranks among the top areas in Canada effected by allergies. Although peanut-free areas can be adopted and certainly no rag weed can be found in your facility…dust, allergens and moisture can be a nasty indoor culprits setting allergic employees into uncomfortable fits. Although dust and allergens are a fact of life there are things a workplace can do to keep dust and allergens down keeping good employees feeling great. One of those things is choosing polished concrete for the floor finish in your office, home, warehouse or facility. Many types of floor, including unfinished concrete, can trap dust, moisture and allergens very easily. The polishing process and products turn your floor into a safe, stylish guard against allergens and mould looking to set up shop in your shop! For more information on managing workplace allergies check out this article. Or for more information about creating a more allergen friendly workplace with polished concrete call Protec at 519-902-0246. So where should I use Dry ice blasting? You may have heard of dry ice blasting and are wondering if your plant, building exterior or project could benefit from this non-abrasive, nonflammable and nonconductive cleaning method. In short yes. If you need a safe, effective cleaning method that won’t pock or mark the surface being cleaning dry ice blasting is for you. If you want to keep production running and your employees on the job, while getting an area cleaned, cleared or prepared for painting, dry-ice blasting will work for you. Don't get me wrong as great a solution as dry-ice blasting is there are some instances of heavy removal that it won't be able to achieve maximum results. Luckily, you always have the friendly staff at Protec Solutions on hand to provide options, free quotes and most importantly...real solutions! How slip resistant is Polished Concrete? Polished concrete floors are quickly becoming the must have finish in industrial, commercial, retail and even residential spaces. It’s no wonder with a cost effective smooth as glass finish that looks good and offers the best in protection. So it looks good, but is it safe? The polished concrete glossy mirror like finish gives a slippery appearance only. In reality they are completely safe to walk and work on when kept clean and dry. In fact, the right finish will make polished concrete less slippery than waxed linoleum or polished marble. • Keep polished floors free of oil, grease and standing water. Follow a routine maintenance program, and clean spills and stains from the floor as soon as possible. • Apply an anti-slip conditioner. These products contain special additives designed to improve traction and make wet surfaces safer. They must be reapplied periodically, but they can simply be mopped on during routine cleaning. • Have Protec Solutions apply a sealer coat to polished concrete that contains an anti-slip grit additive. These products are simply mixed into the sealer before applying to increase traction without taking away from the appearance of the polished surface.